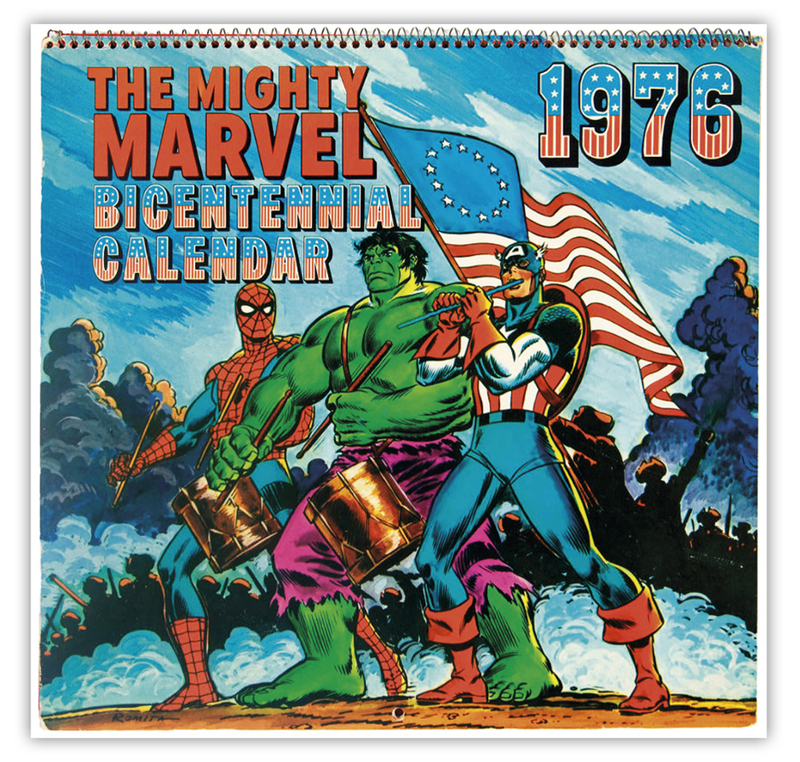 The Mighty Marvel Bicentennial Calendar 1976 | 'TAIN'T THE MEAT… IT'S THE HUMANITY! 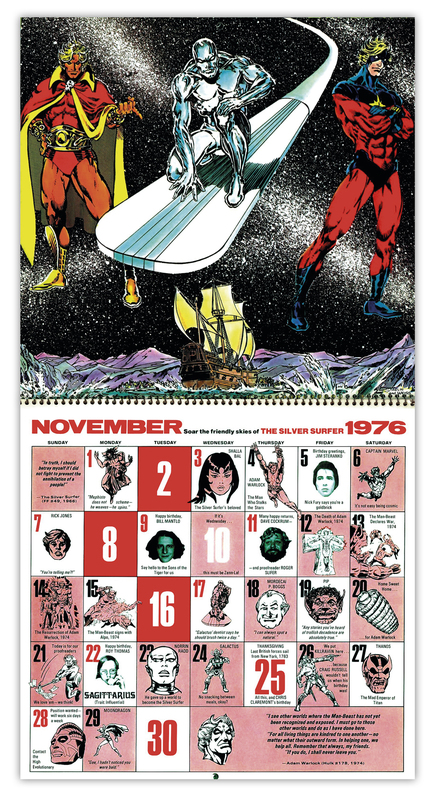 With Christmas rapidly approaching I thought it might be fun to post some vintage oddities from the vaults – beside, I’m still knackered from writing my mega-review of David Hajdu’s The Ten-Cent Plague and I fancy taking it easy for a couple of weeks. 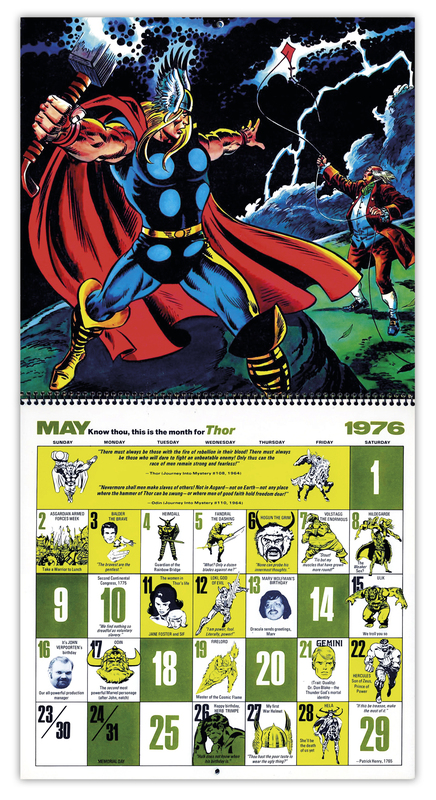 So today I’ve posted some images from The Mighty Marvel Bicentennial Calendar from 1976. 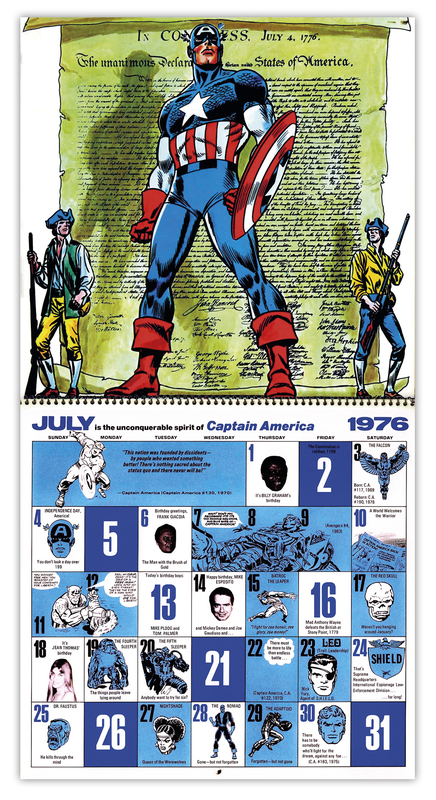 Published to celebrate America’s Bicentennial the calendar featured 12 illustrations depicting Captain America (natch), Spider-Man, The Hulk, The Fantastic Four and other well known Marvel characters in various patriotic scenes inspired by the Revolutionary War. 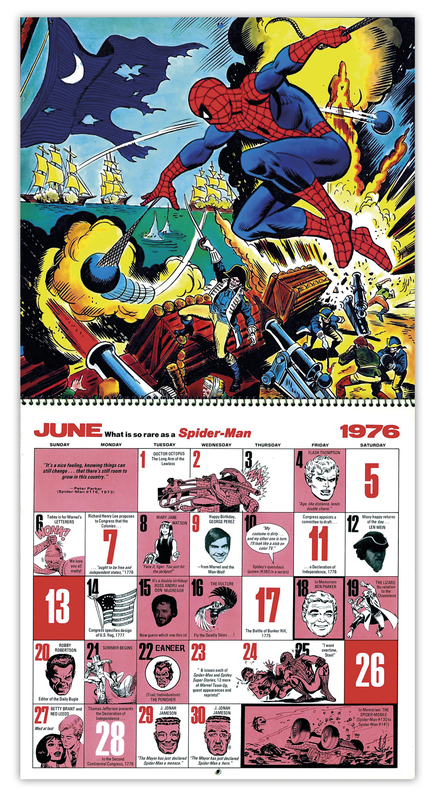 Each illustration is accompanied by that months calendar featuring other well-known characters as well as birthdays of Marvel’s staff. 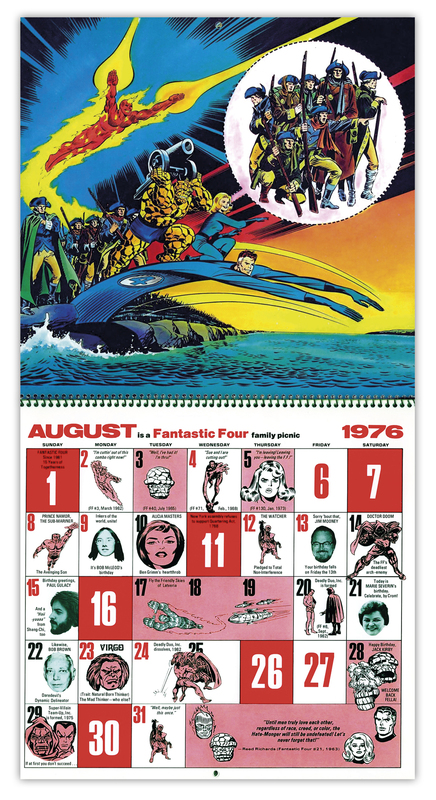 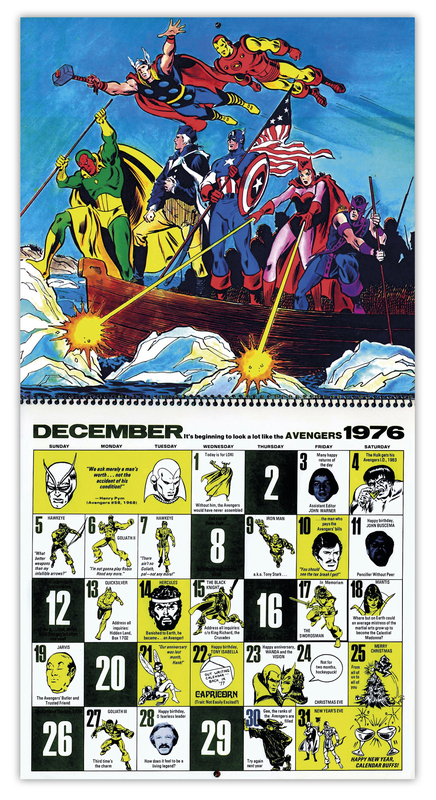 Many of the company’s mainstay artists contributed to the calendar’s artwork, including John Romita (who also drew the cover), Frank Robbins, Herb Trimpe, John Buscema, Ross Andru, Gil Kane, Jim Starlin, Sal Buscema and Frank Brunner. 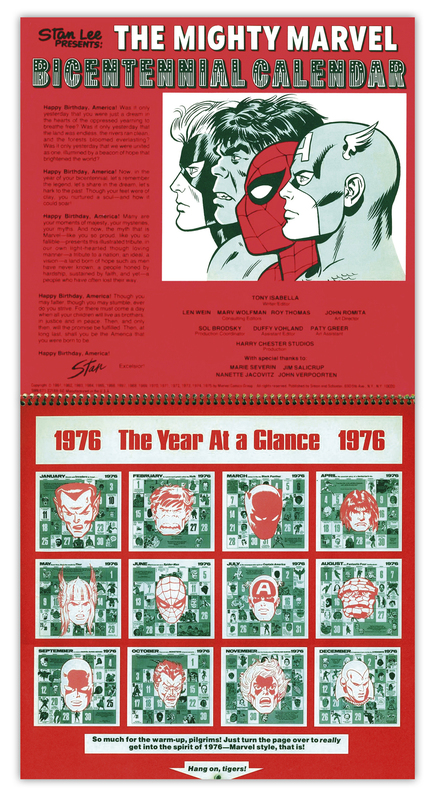 The calendar was spiral-bound, printed on thick white stock and measured 11 x 11.25in. 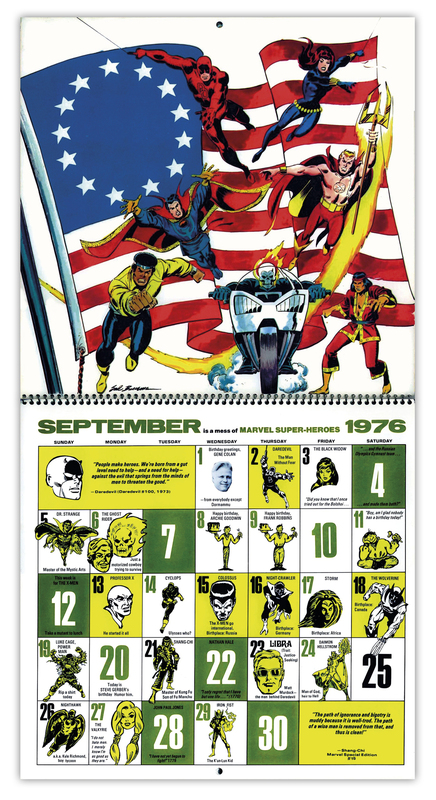 The Mighty Marvel Bicentennial Calendar featured a typically upbeat introduction by Stan Lee as well as some historical background explaining the events featured in the 12 illustrations. 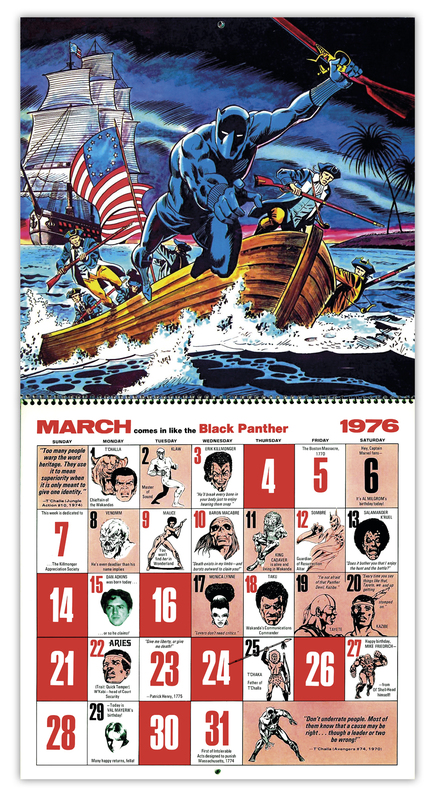 I remember being slightly bemused by this calendar when I picked up a copy in the early Eighties mainly because many of the illustrations don’t really work. 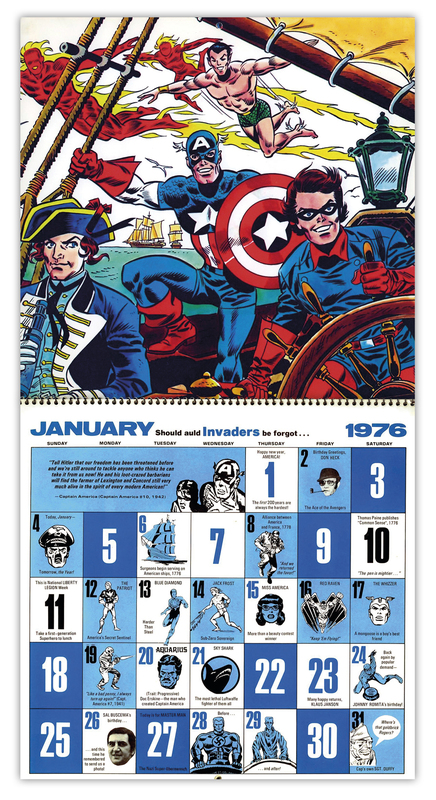 The Avengers accompanying George Washington as he crossed the Delaware I get but Conan leading the Minutemen at Lexington? 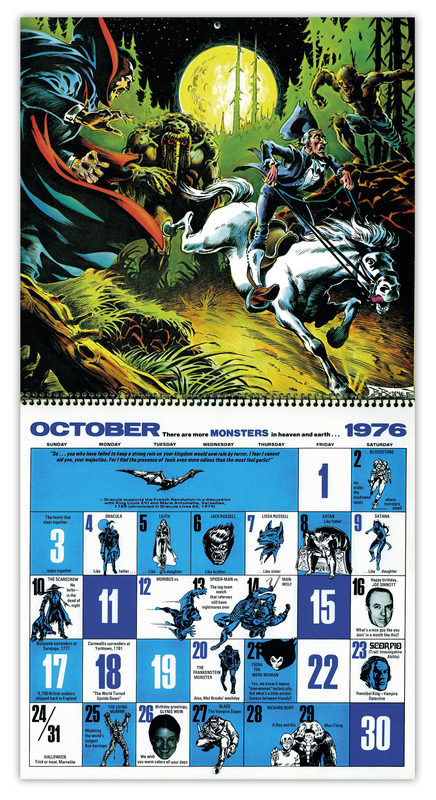 And Dracula and Man-Thing chasing Ichabod Crane? 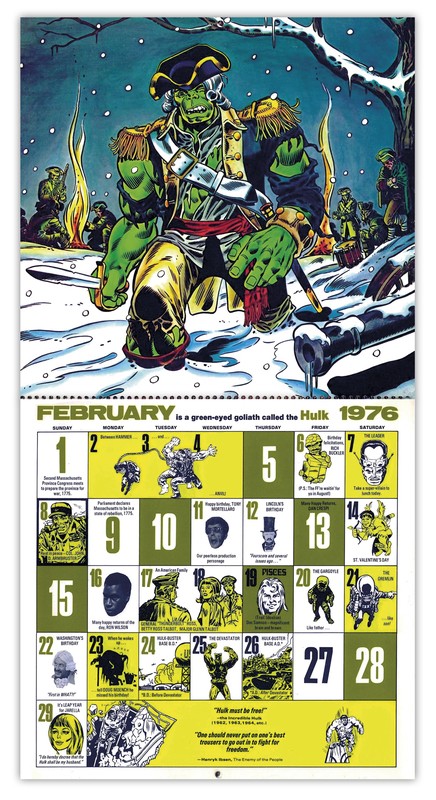 Hmmm, I’m not sure about that. 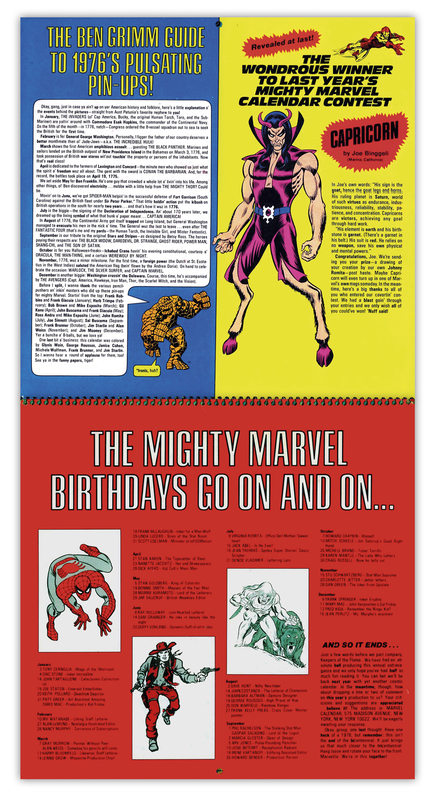 I also remember being particularly interested in the birthdays of Marvel’s staff, although their floating cut-out heads still look a bit odd. 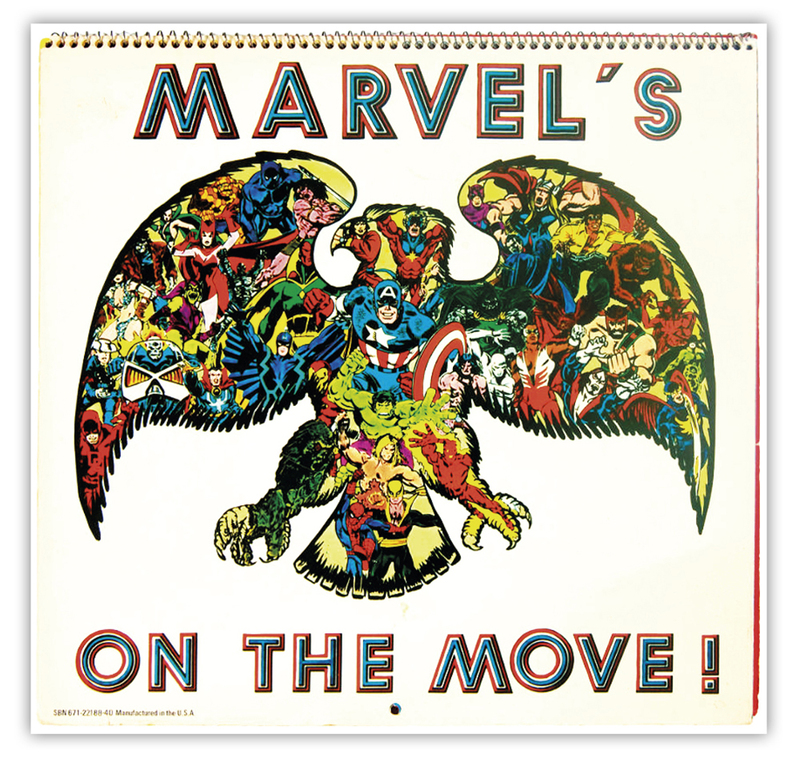 Still, it’s all in good fun and I’m rather fond of this small, albeit quirky, piece of vintage Marvel history.